Lamont and Anthony Peterson will appear on the same card together for the 23rd time in their respective pro careers, yet the latest somehow bring an even greater familial feel. The veteran boxing siblings from Washington D.C. will appear in separate legs of a PBC on FS1 telecast this Sunday live from MGM National Harbor in Oxon Hill, Md. Among those featured on the undercard will be Lamont’s nephew, unbeaten southpaw Patrick Harris Jr. (14-0, 8KOs), who faces Bergman Aguilar on the non-televised portion of the bill. The event marks the first time that all three have appeared on the same show. Harris is the only one among the three who’s fought exclusively in the greater Washington D.C. area. The 24-year old super lightweight from Hyattsville, Md. turned pro in 2014, but none of his 14 bouts prior to this Sunday coming on the same show as his uncle. It will mark the second time he shares a card with Anthony Peterson, with the two appearing on the same April ’16 undercard at the D.C. Armory. Once the cameras begin rolling, the Peterson brothers will find themselves in significant crossroads bouts. Anthony Peterson (37-1, 24KOs) faces former 130-pound titlist Argenis Mendez in a 10-round super lightweight bout in the evening’s co-feature. It will mark just the ninth fight in the past nine years for the 34-year old since his lone career loss, at the hands of Brandon Rios back in Sept. ’10. 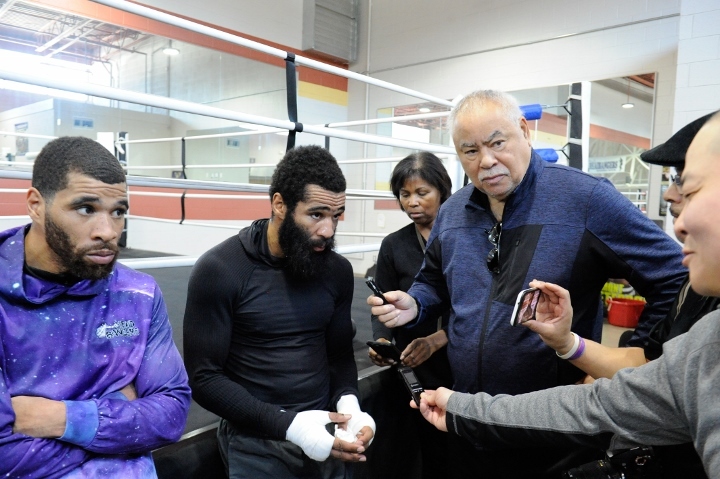 Headlining the show, Lamont Peterson—at 35 the older of the two by just 14 months—will return for the first time since an 8th round knockout loss to Errol Spence Jr. last January. The former two-division titlist squares off with Russia’s Sergey Lipinets, who is just one year removed from his 140-pound title reign. The siblings fought on the same cards frequently in the early portion of their careers but not always at home. The last such occasion came in Oct. '15, when Lamont barely edged out Felix Diaz atop a PBC on NBC show at EagleBank Arena in Fairfax, Va. On the non-televised undercard, Anthony tore through Mike Oliver in just 29 seconds. Sunday's show serves as just the second time in their respective careers that the Petersons were both featured on the same telecast. The lone other occasion came in April '06, when they fought and won in separate legs of a Showtime ShoBox card in North Dakota. This weekend's homecoming will mark the elder Peterson’s seventh career fight in the DMV (D.C./Maryland/Virginia) area, but amazingly his first specifically in Maryland. Apparently, the boxing gods were just waiting for the entire family to be along for the ride.